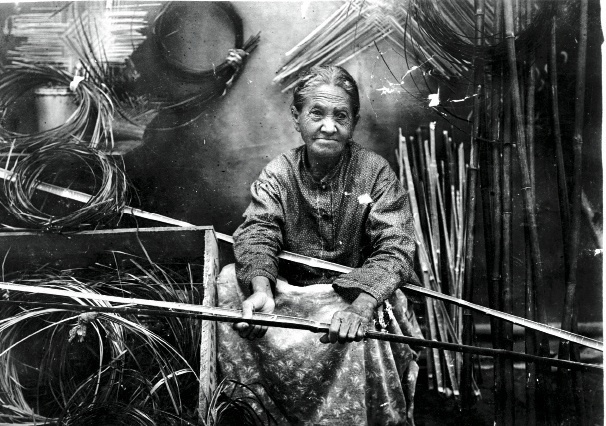 Darden preparing river-cane splints for weaving, c. 1900. Courtesy of the Peabody Museum of Archaeology and Ethnology, Harvard University, 2004.24.26766B. Labels recorded the Chitimacha name of the pattern, here "Alligator Entrails [Guts]." 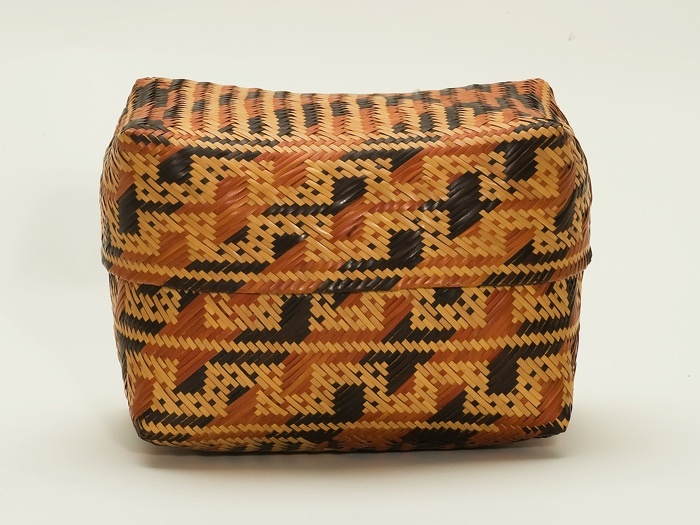 A basket, signed “Scarlett Darden 2002,” by one of Clara Darden’s descendants, displays an X with bull's-eye design pattern: "Waxtik Kani." This basket tray, also signed “Scarlett Darden 2002,” displays the Muscadine design, "Gusbi Suqu," which Mary Bradford rendered as "Grape Skins." [extra:Extra] Above: The photo gallery includes additional images beyond what appears in print. Two great American artists represented in Harvard’s collections died a century ago: the painter and printmaker Winslow Homer, and Clara Darden, a Native American from southern Louisiana who produced unexcelled masterpieces in river-cane basketry, including 11 now housed in the Peabody Museum of Archaeology and Ethnology. Homer is rightly famous, but Darden is scarcely known. In fact, it might appear that there is scarcely anything about her that can be known. Yet writing about Clara Darden is important both to honor her cultural achievement and to challenge the assumption that only those who have left substantial physical or written traces behind, owing to their privileged positions, are fit subjects for historians. Because everyone, potentially, has a place in the historical record, practitioners of the “new history” are unwilling to give attention to some groups while denying it to others. Those who are disadvantaged but law-abiding leave the fewest traces. In American history, no class of person remains more obscure than indigenous women. Darden was most likely born in 1829 or 1830, and seems to have spent her entire life on the Chitimacha reservation at Charenton, in the isolated bayous west of New Orleans. She saw considerable change during her lifetime. Her people had adapted to the way of life of their neighbors, French-speaking Acadians (Cajuns), who had encroached on Indian land since their expulsion from Canada in the 1750s and ’60s. The Chitimacha labored in sugar plantations in the summer, kept market gardens, harvested swamp cypress timber, and wove baskets. French was displacing the Chitimacha language, while Roman Catholicism was supplanting traditional religion. Social organization was changing, too. Darden’s father, Alexandre, was the last leader to maintain traditional tribal structures. A year after his death in 1879, the U.S. Census recorded Clara Darden living with her elder sister and seven other family members. The census of 1910—the year Darden died—returned a tribal population of only 69. 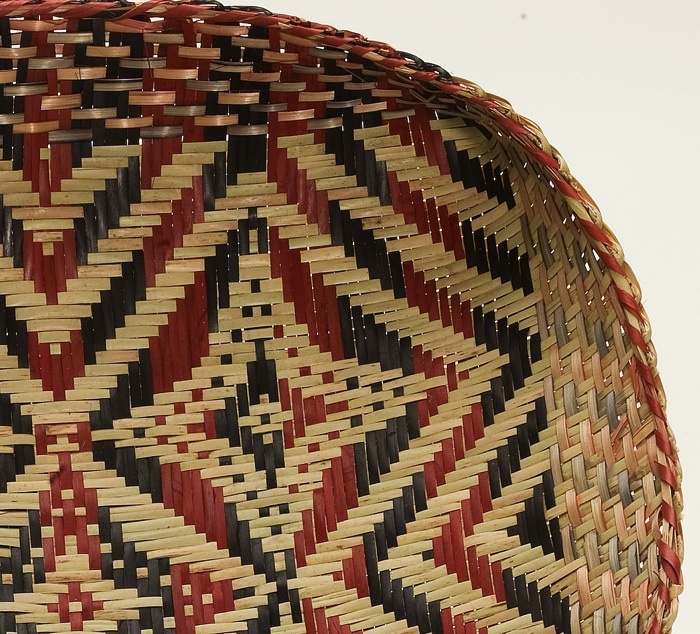 More than a decade earlier, a local white woman, Mary Bradford, had noticed that Darden was the sole surviving Chitimacha practitioner of the intricate double-weave technique producing a basket in two continuous layers of river cane, one inside the other. 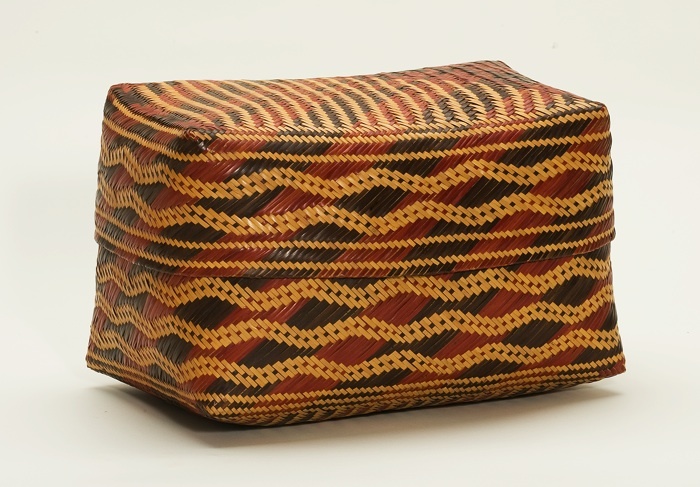 In 1899, Bradford commissioned Darden—by then blind in one eye—to weave baskets exemplifying all the designs she knew. 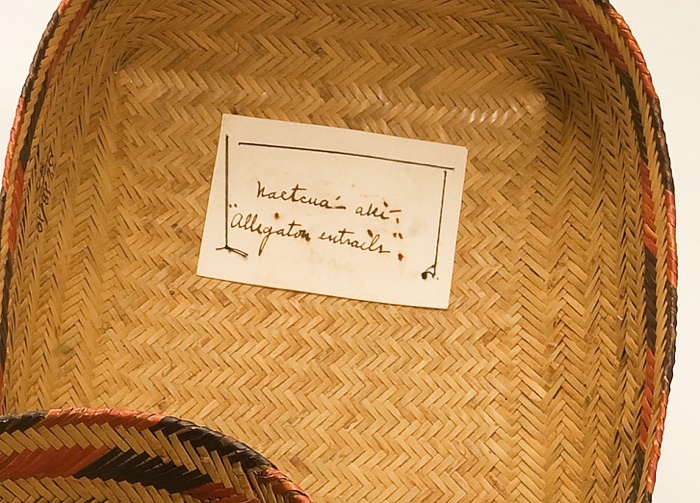 Within five years, Darden and her students had woven no fewer than 72 baskets, which were shown to acclaim at the Louisiana Purchase Exposition in St. Louis in 1904. That same year, Otis Tufton Mason illustrated a selection in his influential book, Indian Basketry, without so much as acknowledging Darden. Bradford tried to sell the collection to a museum to raise money for a Chitimacha school, but none would meet her modest asking price of $150. Instead, the wife of Mason’s publisher raised the money and sent the baskets to the Hampton Normal and Agricultural Institute in Virginia, which educated African Americans and Native Americans. 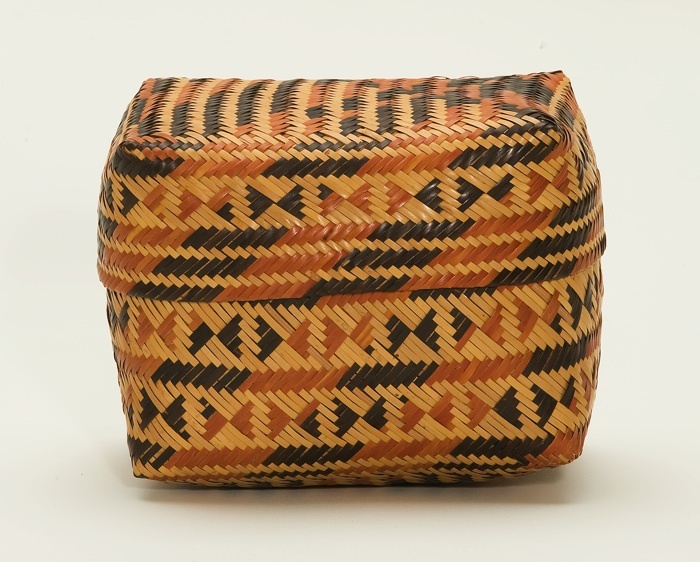 Now in the Hampton University Museum, the collection was meant to provide patterns for basketry classes. 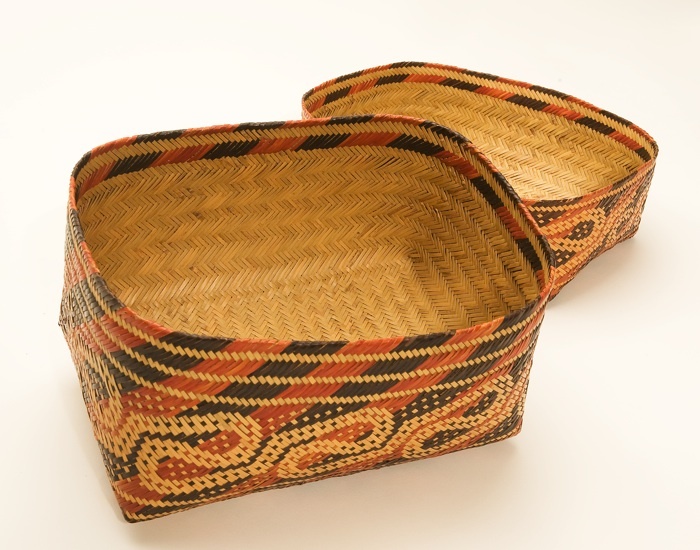 The design of Darden’s baskets—red, black, and plain splints, plaited diagonally—is strikingly similar to the oldest known Cherokee basket, sent to Britain in 1725 and now in the British Museum. 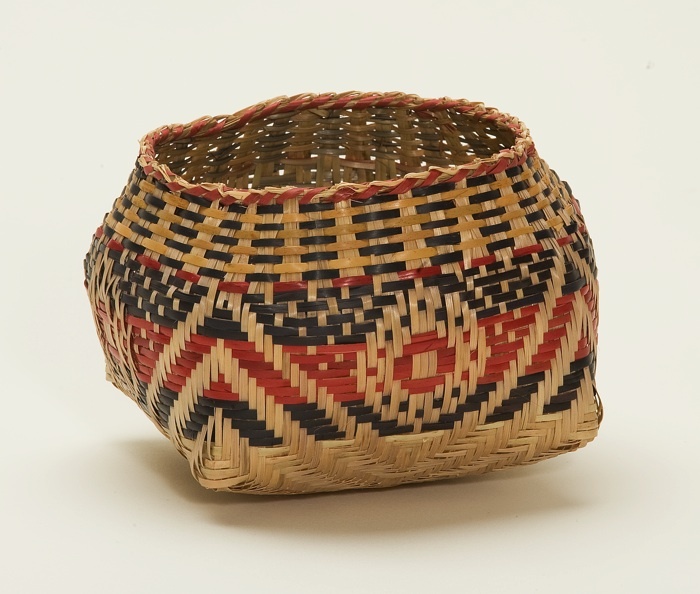 The Cherokee and the Chitimacha are among the heirs to the Mississippian urban cultures disrupted by diseases brought by the Spanish in the sixteenth century, so their basketry practices may have had a common origin. Trade may have sustained shared conventions. 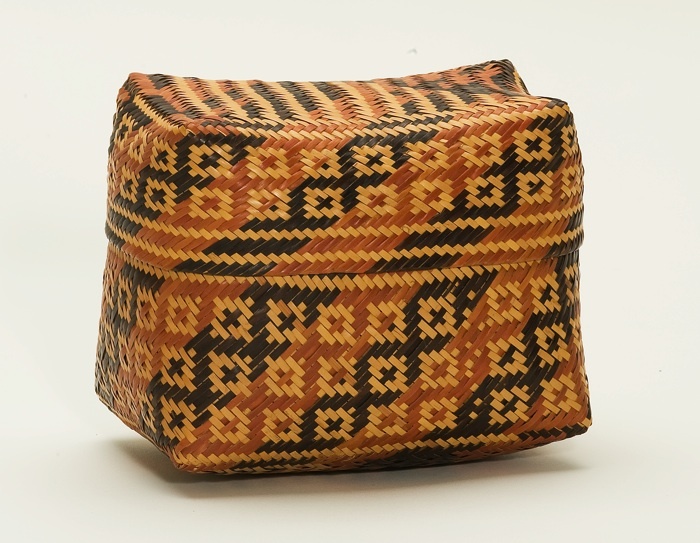 Transmitted through practice, the designs were committed to each weaver’s memory. Bradford recorded Darden’s description of each design in the Chitimacha language—the sole trace of her voice—with an English translation. 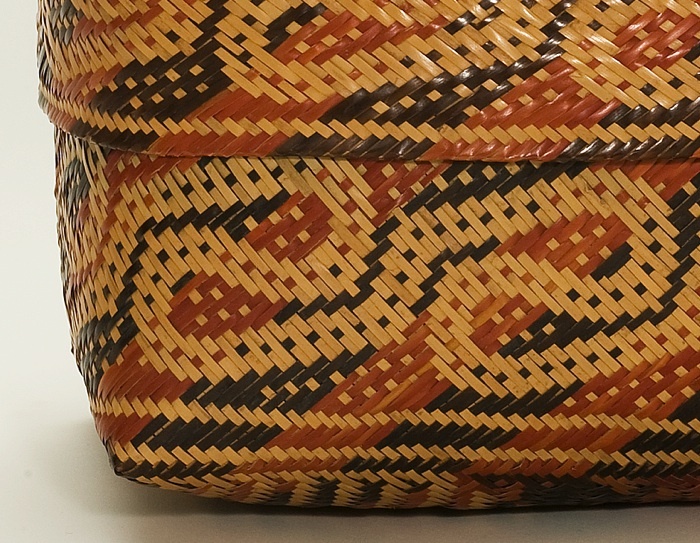 The pattern names, such as “Alligator Guts,” “Worm Tracks,” and “Blackbirds’ Eyes,” enhance the baskets’ association with the natural world of forest, swamp, and bayou. 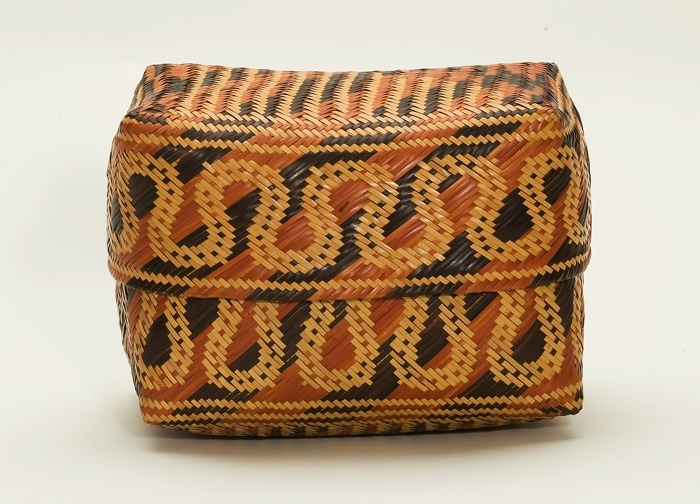 Indian baskets, besides being practical containers, have always had a transcendent character. 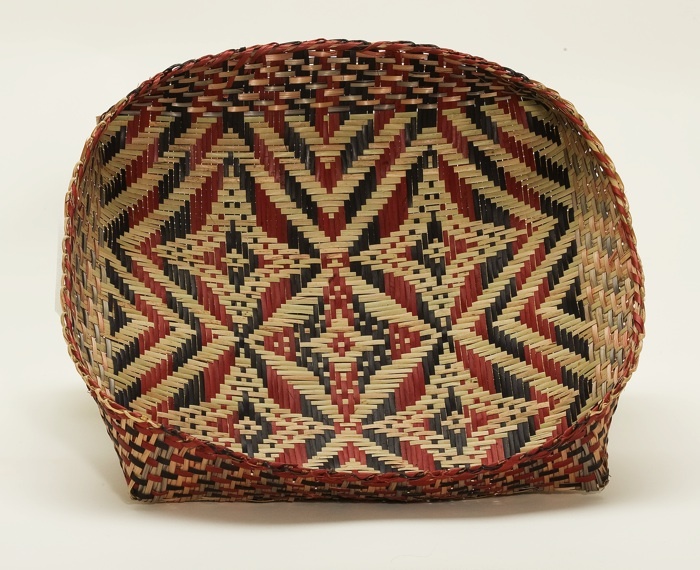 Their associations, although obscure, were likely deeply rooted, for basketry is one of the oldest technologies of the peoples of the greater Mississippi valley. Traces of river-cane baskets from as early as the third millennium b.c. have been excavated within 30 miles of Charenton. 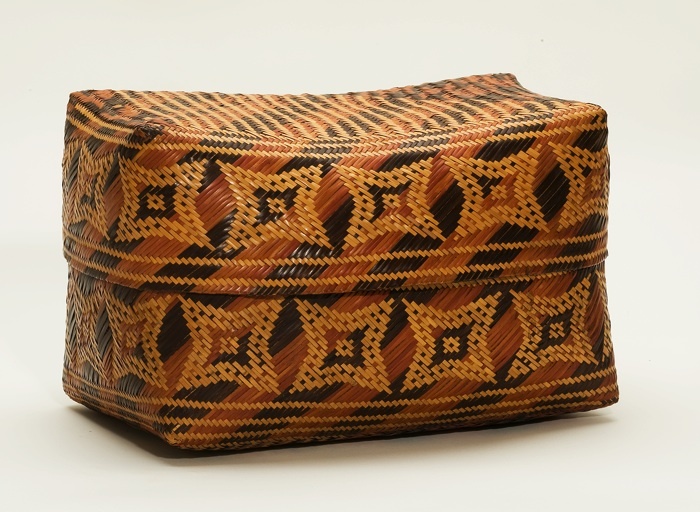 Rectangular, lidded river-cane baskets were discovered in the Spiro Mound in Oklahoma, a site used between a.d. 850 and 1450. They held disarticulated human remains. 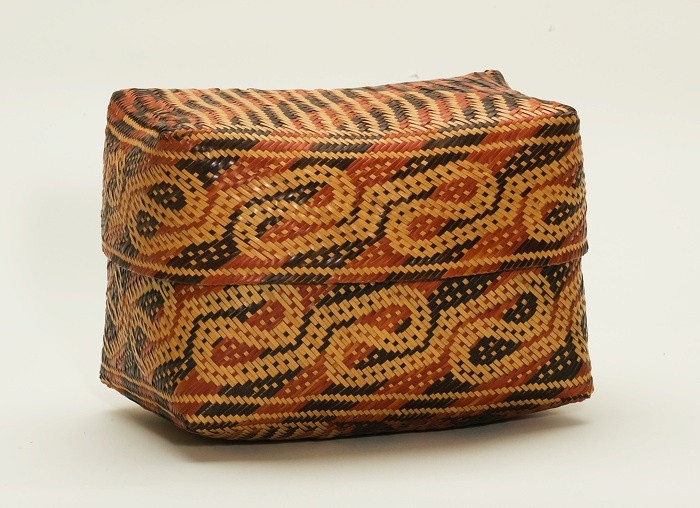 The Chitimacha used lidded baskets to hold human bones or ashes into the nineteenth century, so mortuary practices may have affected the patterns upon them. All we can be sure of is that Darden and her students, followed now by her descendents—contemporary weavers Melissa, Scarlett, and John Paul Darden—have handed down these rich tokens of a sophisticated tradition of both thought and practice. What of Clara Darden herself? Mary Bradford assured the aged weaver that she would erect a headstone at her grave. Not until 1932, aware of her own mortality and of her unfulfilled promise, did she sell her 11 remaining baskets to the Peabody Museum. She received a mere $50—“less than they cost me,” she noted. Only then could she commission a tombstone for the great basket weaver, and install it with the participation of the entire tribe. Cultural historian Ivan Gaskell is Winthrop curator of paintings, sculpture, and decorative arts in the Harvard Art Museum and senior lecturer on history in the Faculty of Arts and Sciences.